Carnegie Hall in New York is the city’s most famous concert venue. Since its opening in 1891, it hosted more than 46,000 performances, including some big names from the classical and popular music scene. Carnegie Hall was built in 1890 by and named after Andrew Carnegie. Fun fact: this Scottish surname is pronounced ‘CarNEgie’, but the building’s name is pronounced ‘CARnegie’. Alright, one more: if you start coughing during a performance, the staff will bring you sweets to soothe your throat. How about that for service? From the outside Carnegie Hall isn’t particularly impressive, but from the inside it definitely is. You’ll see that the moment you walk into the hall, which you can do without a ticket. The building consists of 3 halls. The ‘main hall’ – nowadays the Isaac Stern Auditorium / Ronald O. Perelman Stage – can accommodate 2,800 people, the Judy and Arthur Zankel Hall below can host 600 people and the Joan and Sandford I. Weill Recital Hall 250 people. I haven’t tried them all, but these halls are said not to have any bad seats, only the legroom on the balcony is a bit small. It must be said: Carnegie Hall’s acoustics are brilliant. This is a concert venue with style. Attending a concert is a marvellous experience, especially if you’re staying in New York for a little bit longer. The greatest names in music history performed in this place. Think of Tchaikovsky, Rachmaninoff, Maria Callas and Luciano Pavarotti to name just a few. It’s not just classical music all over in Carnegie Hall though. It also welcomed renowned jazz artists as Miles Davis, Billie Holiday and Ella Fitzgerald. The building is even famed for its long line-up of famous ‘pop stars’: The Beatles, The Rolling Stones, Frank Sinatra, Bob Dylan, Josephine Baker, Stevie Wonder, David Bowie, Nat King Cole and – yes, really – Jay Z. The Theatre’s Rose Museum displays many old theatre programmes, as well as photos, videos and many more things. The museum isn’t too big so don’t go nuts if you can’t see it, but if you’re there anyway you might just as well have a look. You can also get a guided tour of the building. It’s included in the New York Pass. These guided tours are organised a few times a day and you might even be allowed to go backstage. This depends on the rehearsals and performances though. In any case, the guides have lots of information to share with you and the tour lasts an hour. Be aware that you’re not allowed to take pictures and there won’t be any tours between 1st of July and 1st of October. The museum will then be closed. 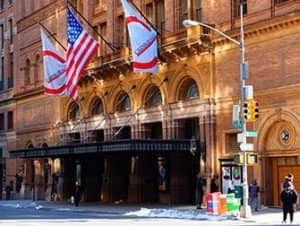 Carnegie Hall is situated in Midtown, just below Central Park. You’ll have lots of restaurants to choose from, making sure you won’t go hungry during the concert. I highly recommend Trattoria Dell’Arte. This Italian place is right across Carnegie Hall and fully understands what its customers want: a welcoming atmosphere and delicious food. Another favourite, perfectly complementing a visit to the concert hall, is the Russian Tea Room. Once you step inside, you feel like you’ve travelled back in time, bursting straight into the Roaring Twenties. You can also go by bus: M5, M7, M10, M20, M31, M57 and M104 all stop nearby. 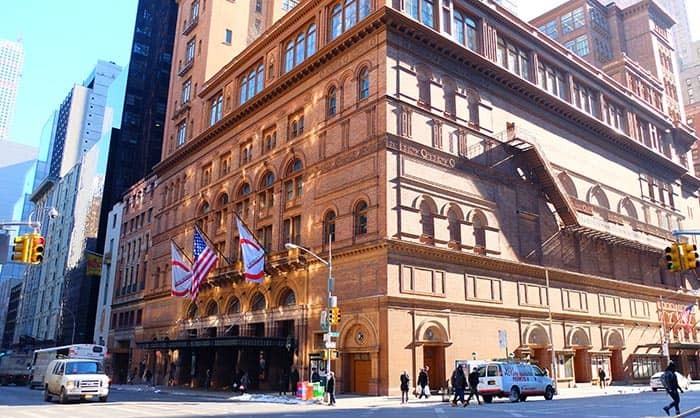 Planning to attend a performance at Carnegie Hall? Buying tickets for Carnegie Hall is simple but do make sure to book on time. It’s hard to indicate a price, since this depends on the type of performance and the seat.